Happy Friday everyone! 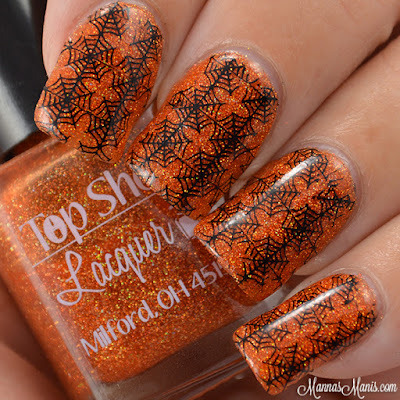 You may remember I reviewed Top Shelf Lacquer's Halloween collection recently. I did some simple stamping with the orange, Candy Corn Cordial! Earlier in the day, I attempted to do a Halloween watermarble. After an hour of fighting with everything, I said screw it. The watermarble odds were just not in my favor that day! So, I decided to do some stamping. Base is Top Shelf Lacquer Candy Corn Cordial, plate is Pueen 01, and I stamped using bornprettystore's black stamping polish. I could not get the image to pick up using a creative stamper, so I had to kick it old school with my very first stamper, which is firm, and makes placement difficult for me. My non swatch hand ended up looking better than my swatch hand, how irritating is that?? Top Shelf Lacquer still has a few left from her Halloween collection, so check em out!